Wind River Ranch is a Christian Family Dude Ranch located seven miles south of beautiful Estes Park, CO. For over 80 years, guests have enjoyed the jaw-dropping beauty of Wind River Ranch. 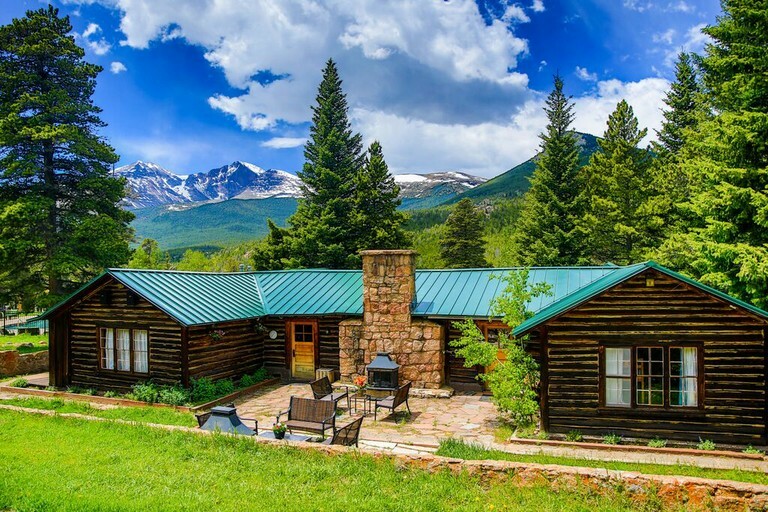 The ranch is perfectly placed between the majestic Longs Peak (14,259′) just beyond our front gate and the Twin Sisters Mountain range as our back yard. God’s beautiful creation surrounds you; from the soaring spires of Rocky Mountain National Park to gentle meadows blanketed with wildflowers. Wind River Ranch is the ideal spot for a summer vacation, far away from the heat and busyness of life. At Wind River Ranch, you can be as busy as you want to be. Our guests enjoy our daily horseback rides through the scenic Rocky Mountain National Park, fly fishing in our stocked pond and guided trips on one of the many streams and rivers in the area, climbing wall and dual 550 foot zip lines, family challenge course, basketball, disc golf, and dozens of other family friendly activities. Of course, after a full day of fun, nothing beats a soak in our heated pool and hot tub. Wind River Ranch has something for all ages. We provide daily activities in the morning for the little kids in our fantastic nursery (babies – 2), the children (3 – 7), the tweens (8 -12), and the teens (13 and up) led by staff that are handpicked for their passion and ability for working with these age groups. All kids programs are optional, but the kids and teens will be ready to join the staff and their new friends each day. We also offer babysitting for the little ones in the afternoon during horse rides at no extra cost. Many of our guests return year after year because of the activities, the scenery, the rustically elegant cabins, the food, and the service; but mostly they return for our staff. We spend the entire off-season painstakingly selecting each individual to serve at Wind River Ranch. Our staff is composed of college-aged students from all over the country and are the kind of young people you want your children to emulate. Quality service is a way of life at Wind River Ranch. Your meals are provided by our executive chef and kitchen staff, your cabins are cleaned daily by our housekeepers, and our staff is available to help make your week at Wind River Ranch the best week of the year. Please visit our website for more information, dates, prices, and amazing pictures and videos! Our rustic log cabins are neatly tucked away, interspersed throughout the ranch among the aspen groves and pine trees. The quiet and serenity of these cabins invites you to slow down and sit in one of the willow rocking chairs on the porch. The log and rough sawn bat and board cabin exteriors are what you were expecting and the interiors of the cabins exceed your expectations with their true rustic elegance. All of our cabins now have remodeled master bedrooms and baths. The original wood floors will welcome your feet and the new mattresses and western comforters will help you rest well on your vacation. The slate walk in showers are 5 star and many have two rain shower heads. The copper sinks, the granite counter tops and alder custom cabinets and trim are just some of the luxuries to help you feel comfortable. Many of our cabins include fireplaces, rustic furnishings, daily maid service, and breathtaking panoramas of snow-capped Rocky Mountain peaks from your very own private front porch! Please go to our website and view the cabin layouts for each unique cabin. You will find no televisions at Wind River Ranch. It doesn't take long, however, for that to become a matter of little significance. Wind River offers activities of all kinds for all age groups. Enjoy the thrill of a horseback trail ride through the Rocky Mountain National Park, kayaking in any of our three locations including Lake Estes, Sprague Lake, and Lily Lake, rafting down the Cache La Poudre River, or trying your hand on our new climbing wall and super fast zip line. In addition, you will have fun golfing in Estes Park, swimming in our resort swimming pool, relaxing in our 8 x 16 stone hot tub, playing Frisbee golf on our mountain course, hitting the volleyball on our sand court, and shooting basketball on our full-court facility. We also have Ranch Olympics where the Olympic torch will start the event on Monday. The kids can head to the recreation building to try their hand at the variety of games at no charge. Thursday night after our steak dinner, everyone will head to the Hootenanny, a night of comedy based on the good-old days of live rural entertainment. (Hooting and hollering is accepted and appreciated, laughter is good medicine!) Be sure to snap family photos in front of our Kid's Old West Town and wet a line in our pond located in the Lower Meadow that is stocked with Rainbow and Brown Trout. The largest one caught is 23 inches. Shopping in nearby Estes Park is also a popular offering that has many unique shops and plenty of chocolate and ice cream shops. Three nights a week we have Fireside, this is led by the weeks' inspirational speaker and our musically talented staff. These encouraging times of worship are sure to inspire you and your family while at Wind River Ranch. Guests come to Wind River for the fun activities, the breathtaking scenery, and the excellent staff and speakers, but they quickly learn how wonderful the food program is here. The food and the fellowship around the round rustic tables with family and new friends becomes a special part of the week. At Wind River, meals are designed to be more than simple sustenance - whether it's a family style dinner, an outside cookout, or a morning horseback ride to our wrangler breakfast - each meal is designed to be memorable. Of course, the highest quality food adds to the experience. Our executive chef will bless you with western staples such as succulent steak dinners and slow smoked BBQ ribs, but don't be surprised to find grilled fish and chicken, fresh fruit and vegetables on the menu as well. What about dessert? Oh my yes! No matter how full you are, you will find room for our homemade desserts like: chocolate e'clair pie, fruit cobblers, and homemade cheesecake. Does a family member have dietary limitations? Not a problem - our kitchen staff delights in creating special meals for those with food allergies or special needs. Simply let us know when you book and the chef will design a menu that delights your taste buds for the week. NO TIP is required, some guests choose to give a donation to help cover the staffs activities and meals on the Saturday evening. We have situated our large heated outdoor pool as well as our hot tub to showcase the beautiful mountain vistas. The pool area has been designed with an emphasis on fun and relaxation! We have a stocked trout pond on property for folks to enjoy. For those guests who want to go fly-fishing in one of the premier streams in our area, we would love to help them book with one of the local fly-fising outfitters. Cell phone coverage and wireless internet are available in certain areas of the ranch. We also have a business center with 3 computers, a printer, a place to plug in your laptop or make a phone call. There is no charge for these services. WRR is available for private conferences in September and October. This year we have three couples' conferences as well as a pastors' retreat. Please go to our website for more information and details on the dates and program. September/October are fantastic months to enjoy Colorado. Families reunions are welcome to book the entire ranch or just join right in with our other guests. The director would love to give you a special rate on 10 or more people. Please book early as we would love to give your family both sides of the Ranch House as accommodations and you get exclusive use of the Ranch House library/meeting room. Please call for more details at 1-800-523-4212. 10% discount with groups bringing 10 people or more.